Boasting a climate of eternal springtime, Plettenberg Bay and Bitou surrounds makes it a year-round destination and central destination from which to explore the Garden Route of South Africa. 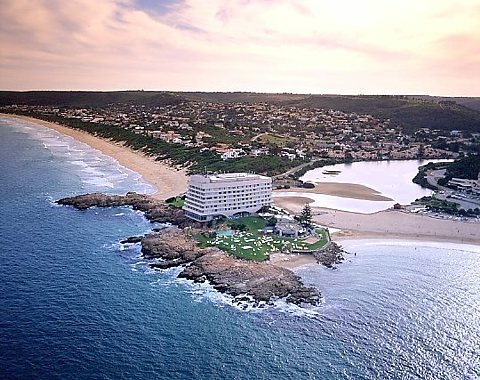 Plettenberg Bay is often packed with "ing things to do - watching, doing, enjoying. Whether you're staying for a weekend or a month you'll always find "ing" things available to suit all interests, ages and life-styles. Our exceptional climate means the main emphasis is on the outdoors, where quality of life, peace and peace-of-mind are all assured. Staying - a wide variety of approved accommodation is available to suit any individual, family and tour group's requirements and budgets - from back-packers' economy through self-catering, bed& breakfast establishments to the very best in luxury hotels. Eating - you'll find top class international cuisine, friendly "bistros", family restaurants and pub meals all in Plettenberg Bay. Helping - the shops and services you'd expect to find to suit your needs are close by - naturally including professional medical facilities. On the highways and by-ways you'll find a wonderfully diverse range of arts & crafts centres, and our theatre features a regular line-up of famous entertainers. Water sporting - apart from enjoying swimming on our safe beaches, you'll find sailing, canoeing, fishing, snorkeling, scuba-diving, surfing, water-skiing and swimming in the lagoons and sea. Exploring - formal and informal hiking, biking and horse-trails, from easy to strenuous, are all on our doorstep. The legendary Tsitsikamma forest and Storms River Mouth are an easy drive away, as is Knysna, with it's forests, lagoons, steam train excursions and famous fresh oysters. Touring - either self-drive or with qualified and registered local guides, is a rewarding experience - The Garden Route stretches out temptingly on both sides inviting us to take delightful day trips. Golfing - a choice of courses is available. And, naturally .... relaxing - our beaches are always a tempting alternative! Endless white beaches and a “Blue Flag” beach. Boat-based and shore based whale and dolphin viewing. Robberg marine and nature reserve. Discerning accommodation and inspirational food. Wildlife Sanctuaries – from monkeys and birds to elephants and wolves. Inspiring Afrika! Township tours and experiences.